A poor sense of smell is likely on the bottom of most people’s lists of medical concerns, but what few people realize is that it can be one of the first warning signs of Alzheimer’s disease and dementia. Numerous studies are finding that when dementia strikes, sense of smell is one of the first things to go. In both animal and human studies, people with Alzheimer’s and other forms of dementia have had a significantly worse sense of smell, even when there were few other noticeable signs. Researchers believe that they may eventually be able to use smell tests to accurately predict who will develop dementia. Until then, however, it may be a good idea to get checked out if you notice a loss in your sense of smell. While it can be hard to draw broad conclusions about individual studies, there seems to be a link between dementia and a poor sense of smell. Studies keep finding the same thing: losing your sense of smell is associated with cognitive decline and dementia. In one study conducted by researchers at Harvard Medical School, elderly people who were healthy and who scored worse on smell tests had smaller brain volume in areas associated with memory. Furthermore, they were more likely to suffer from poor memory when compared to their peers. Even for healthy people, losing their sense of smell could be a sign of other things going on within their brains and bodies. Another study from Columbia University found that the lower a person scored on a smell test, the more likely they were to develop dementia in the following four years. In fact, for every point scored lower on the smell test, there was a 10% increased risk of developing dementia. Another study from researchers at the University of Florida had participants sniffing a spoonful of peanut butter under their noses. As with the other studies, similar results were discovered. Participants with an early diagnosis of Alzheimer’s disease had more trouble smelling the peanut butter. Sense of Smell and Dementia: What’s the Connection? So we know that a decreased sense of smell is associated with dementia, but what exactly does our sense of smell have to do with cognitive decline anyway? Researchers believe that the areas of the brain responsible for smell are the first to go with dementia—even before the parts of the brain that are responsible for memory are affected. What this means is that before you notice the typical symptoms of Alzheimer’s disease or dementia, damage to your brain may have already occurred. In fact, you could have dementia without yet having any problems with your memory or thinking. Researchers have found that a lost sense of smell may be due to buildup of a toxic plaque in the brain. The protein beta-amyloid causes plaque to form in the brain of Alzheimer’s patients. In animal studies, researchers have found that mice with plaque also have a lower sense of smell. However, removing the beta-amyloid plaque results in mice regaining their ability to smell. Unfortunately, we are not yet able to remove beta-amyloid from the brains of people with Alzheimer’s disease. Researchers are hopeful that eventually these findings will lead to treatments to help slow or stop the progression of Alzheimer’s disease. While a treatment or cure for Alzheimer’s is still in development, there are still some important things we can take from this research. The first is that if you do notice a sudden decreased sense of smell, you should get checked out by your doctor. It could be a sign of Alzheimer’s disease or dementia. As well, it may be a good idea for older people to pay special attention to their sense of smell. We typically do not think much about our ability to smell, but as this new research suggests, monitoring your sense of smell could be the difference between an early diagnosis of dementia or having to wait until the disease progresses. When caught early, you can better manage dementia. While there’s no cure for dementia as yet, there are some actions that can help slow the progression of the disease. The truth is, while losing your sense of smell can be a sign of Alzheimer’s disease or dementia, there are many other less serious conditions that can also cause this. One of the most common causes of losing one’s sense of smell is congestion and sinus infections. If your nose is blocked or inflamed, then you are going to have difficulty smelling. If you have no sense of smell and you are also congested, it will be almost impossible to tell if dementia is to blame. By clearing up other possible causes first, you can help determine when poor sense of smell is abnormal or is the result of the onset of dementia. Luckily, there are natural treatments that are great for improving your sense of smell! Castor oil is antiviral, antibacterial, and antifungal, which makes it a great treatment for mild sinus infections. Castor oil not only reduces congestion and inflammation, it is used for curing nasal polyps, which are growths in your nose that can block your nasal passage. To use castor oil, simply put one drop of the oil in each nostril twice daily. It is best to warm your castor oil, although it shouldn’t be hot, as this can cause damage and burning in your nasal passages. Lean your head back and allow the castor oil to flow to the back of your nasal passage to help clear up any congestion you have. Garlic is another very effective treatment option for poor sense of smell, as it is antiviral and antibacterial. Luckily, there is no need to stick garlic up your nose! This treatment can be done by simply chopping a few cloves of garlic and adding them to some simmering water, like you would do with a bag of tea. Drinking this once to twice a day will help clear up your sinuses. Natural treatments aren’t just good for improving your sense of smell—they’re also good for improving the health of your brain, which can reduce your chances of developing dementia, Alzheimer’s disease, and other forms of cognitive decline. Vitamins and nutrients are essential to the healthy functioning of your brain. B vitamins have a positive influence on the formation of nerve cells, but they are unfortunately not stored in your body. If you are lacking in B vitamins, your brain may not be functioning to the best of its ability and you may experience forgetfulness or memory loss. Supplementing with vitamin B12, as well as other B vitamins, can help keep your brain healthy and sharp. Another great way to improve your cognitive function is by eating foods rich in antioxidants, as these protect your brain cells from damage. Fruits and vegetables are a very good source of antioxidants, and eating a diet rich in colorful fruits and vegetables can help reduce your chances of dementia. However, one of the best ways to get antioxidants is by drinking green tea. Green tea contains polyphenols, an antioxidant that can improve memory and slow age-related mental decline. Another natural option that is commonly used with patients who have Alzheimer’s disease are omega-3 fatty acids. Omega-3 fatty acids have been shown to improve cognitive function and may be one of the best options for preventing dementia. You can use an omega-3 fish oil supplement to get your daily dose of these important fatty acids. Walnuts, flaxseeds, spinach and “fatty” fishes like salmon, tuna, and trout are also good sources of omega-3 fatty acids. Eating a diet rich in these foods will help keep your brain sharp. Your sense of smell is directly tied to your cognitive health. You now know that when you begin to lose your sense of smell, it could be an early warning sign of dementia. Luckily, it isn’t hard to improve your cognitive functioning and get back a lost sense of smell. There are many natural substances that can be effectively used to help prevent cognitive decline and help with a poor sense of smell. If you’re worried about Alzheimer’s disease, making some simple natural changes in your life and diet can have a big impact. “Loss of Smell, an Early Alzheimer’s Sign, Reversed in Lab,” The Fisher Center for Alzheimer’s Research Foundation web site, https://www.alzinfo.org/articles/loss-smell-early-alzheimers-sign-reversed-lab/, last accessed November 26, 2015. 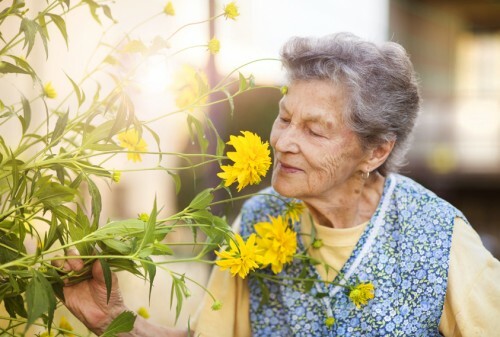 “Loss of smell linked to cognitive decline and dementia in older people,” Alzheimer’s Society web site, July 13, 2014; https://www.alzheimers.org.uk/site/scripts/news_article.php?newsID=2097. “Natural Cures for Loss of Smell,” Earth Clinic web site, last updated November 4, 2015; http://www.earthclinic.com/cures/anosmia.html, last accessed November 26, 2015. Reilly, P., “Natural Ways to Improve Cognitive Function,” Good Works Wellness web site, September 14, 2011; http://goodworkswellness.com/natural-ways-to-improve-cognitive-function/. Sauer, A., “Can’t Smell Peanut Butter? Alzheimer’s May Be The Culprit,” Alzheimers.net, September 19, 2014; http://www.alzheimers.net/2014-09-19/peanut-butter-test-predicts-alzheimers/. Smith, M., et al., “How to Improve Your Memory,” HelpGuide.org, http://www.helpguide.org/articles/memory/how-to-improve-your-memory.htm, last accessed November 26, 2015.